Open innovation has become a widely discussed phenomenon in both the US and in Europe in the ten years that have passed since the publication of Henry Chesbroughs book Open Innovation in 2003. There are many examples of individual companies that have adopted open innovation. But more systematic evidence of the extent to which open innovation has been adopted is surprisingly scarce. The Garwood Center for Corporate Innovation at the University of California, Berkeley, in the US and the Fraunhofer Society in Germany have teamed up to conduct the first large sample survey of open innovation adoption among large firms that we know of. Surveying large firms in both Europe and in the US with annual sales in excess of $250 million, this survey report presents many important facts that show to which extent and how large firms are now practicing open innovation. Overall, the survey results paint a picture in which open innovation is on the rise. While firms are somewhat satisfied overall with their open innovation experience (and their satisfaction increases with more experience), there is plenty of room for improvement. For example, inbound practices are more commonly utilized than outbound practices. Individual practices are not rated all that highly in their effectiveness and individual metrics are not rated very highly either. 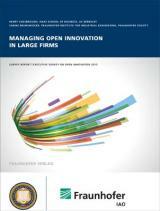 Results indicate that firms are still early in their use and understanding of open innovation.